My brother suggested that we checkout http://london.fattirebiketours.com/. He took tours in both Paris and London and thoroughly enjoyed them. Fat Tire offers a 4 hour Royal Tour that looks like it goes all throughout the parks (Kensington, Green, St. James and Hyde Park). At £20 for 4 hours - it is fairly reasonable. My experience with tour guides in Europe is that they are highly entertaining. 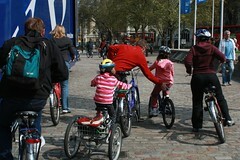 What I like about it is that it is family friendly - they will provide bikes for all ages and sizes. If you are going with a family make a reservation so they actually have the smaller bikes waiting for you. 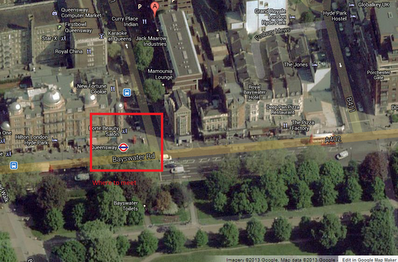 Reservations are not required though and you can pick up a tour outside Queensway tube station. (Look for the red phone boxes). They also have a twilight River tour that actually sounds more fun to me. It sounds like it is a little bit more strenuous and may not be as family friendly. Reservations are required for this one. It looks like it hits all of the big destinations like St. Pauls, Tower of London, Monument, Leadenhall Market and London Eye.